The 2016-17 Rotary year will be the centennial year for The Rotary Foundation, which started at the 1917 Rotary convention in Atlanta. This issue of The Rotarian magazine is filled with information about the exciting 2016 convention to be held in Seoul, 28 May-1 June – and part of the excitement is due to the kickoff activities for the Foundation’s centennial celebration. The Foundation has a Centennial Celebration Committee, which is chaired by Past Trustee Stephanie Urchick, and the committee has comprehensive plans for a full year of celebratory events, which will culminate in a giant celebration at the 2017 Rotary convention in Atlanta. The Foundation trustees, Rotary International directors, and Rotary staff members are all committed to a successful recognition of the Foundation’s anniversary because of the Foundation’s significant role in helping our clubs and districts to conduct service projects around the world. The Rotary Foundation clearly has been a tremendous force for Doing Good in the World! And as we contemplate our high-level plans for the centennial, we once more pause to recognize and appreciate that the totality of what happens in our clubs and districts is far bigger and longer-lasting than what happens in Evanston and at the conventions. As a result, the true success of the centennial celebration will depend on the quality and quantity of the celebratory events in our clubs and districts. The big question is whether our Rotarians around the globe will embrace the Foundation’s centennial and undertake their own centennial projects and celebrations. So please do your part to stimulate the interest and involvement of your club. The Rotary Foundation has been highly successful in assisting our clubs and districts to promote international understanding, goodwill, and peace in the world – and therefore, it is appropriate that all of our clubs and districts should participate in the centennial celebration. As usual in Rotary, there is no prescribed way in which the clubs and districts should join the celebration, and I hope our clubs and districts will be as creative in their celebratory activities as they have been in their myriad humanitarian projects throughout the years. 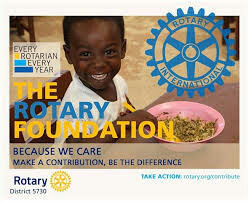 This is the right time for all of us to express our appreciation for The Rotary Foundation! John Borst’s career in education spans the years 1960 to 1996. During those 36 years, he spent an equal amount of time working int he English language, Public and Catholic school boards. Borst taught in both elementary and high school environments. Positions of responsibilities held included department head in Geography, curriculum coordinator of Social and Environmental Studies, Principal, Education Officer with the Ministry of Education, Superintendent of Schools, and Superintendent of Student Services. Borst retired in 1996 as Director of Education for the legacy Dryden Board of Education. During this time, Borst has lived in the Ontario communities of Brampton, Toronto, Newmarket, Thunder Bay, Aurora and Dryden. Currently, Borst splits his time between Dryden and Toronto. Since retirement, Borst has served as a Supervisory Officer with a remote School Authority; been a freelance writer of articles on education in particular for Education Today, the magazine of the Ontario Public School Boards’ Association (OPSBA); founded and edited from 2006 - 2010 the Education blog Tomorrow’s Trust: A Review of Catholic Education; and from 2003-2010 was a trustee of the Northwest Catholic District School Board. This entry was posted in Columnists and tagged 2016-17, Centennial, Rotary Foundation. Bookmark the permalink.